Doctor Who: Endgame | Warped Factor - Words in the Key of Geek. 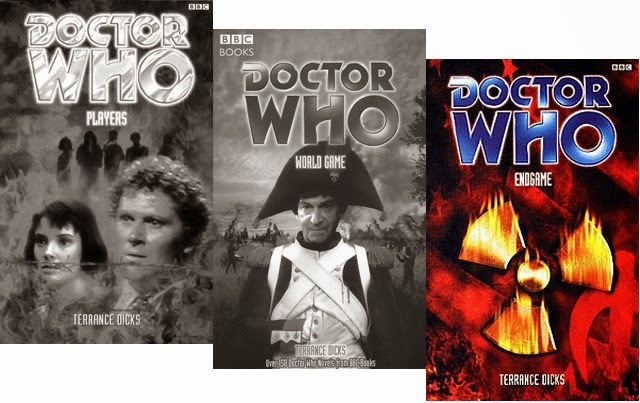 The endgame of Terrance Dicks' Players trilogy arrives in, well, Endgame- the amnesiac Eighth Doctor unable to remember all but the briefest flickers of his past encounters with the Players themselves. 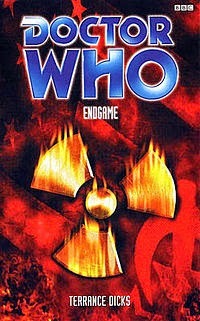 For the events which see him thrust into intrigue surrounding the Cambridge Spies & an attempt to ramp up tensions around the Cold War occur during the Earth Arc, a series of seven Eighth Doctor Adventures novels which see him stranded on Earth in a similar position to that which followed his second regeneration. And so where World Game allowed the Second Doctor into the sort of territory mined by Bernard Cornwell for his Sharpe series, here Dicks is given licence to plunder the murky world of espionage! The Doctor's desire for a quiet life is uprooted by the aforementioned important file after he is conscripted into becoming an agent for TIGHTROPE- a secret organisation devoted to investigating the machinations of the Players. By now they've grown somewhat bored of mucking about with the established history of what you might call our little planet's greatest conflicts & decided to go out with a quite literal bang. If the dirty great big nuclear symbol on the cover doesn't give it away, please do feel free to read on. For their last dip into royally screwing things up sees them make it their business to ensure the diplomatic stand-off between the Americans on one side & Russians on the other gets a good deal warmer thanks to the threat of total & utter devastation of the sort which the Yanks have by this point already inflicted upon both Hiroshima & Nagasaki. One of the key men within the top-secret framework of TIGHTROPE is Kim Philby, who will go down in history alongside Donald Maclean & Guy Burgess as traitors to their country after defecting to Moscow. Understandably given his situation he needs a ''third man'' to take the heat off himself! And that third man is the Doctor, who is forced to help Burgess & McLean flee the country before news of their defection breaks as well as looking into the alien enemies he barely recognises in his present state. "During World War II, psychological warfare was largely seen as an accessory to military operations, but with the onset of the Cold War, psychological warfare specialists defined the concept broadly to include any non-military actions taken to influence public opinion or to advance foreign policy interests. Psychological warfare was transformed into a catchall formula that went beyond mere propaganda to embrace covert operations, trade and economic aid, diplomacy, the threat of force, cultural and educational exchange programs, and a wide range of clandestine activities. Psychological warfare became, in essence, a synonym for Cold War. It reflected the belief of many politicians and foreign policy analysts that the Cold War was an ideological, psychological, and cultural contest for hearts and minds that would be won or lost on the plain of public opinion rather than by blood shed on the battlefield. Psychological warfare in the Cold War context was also associated with the policy of "rollback," or the employment of non-military means to force the retraction of Soviet power and the "liberation" of Eastern Europe." And it's what he sees while touring a facility devoted to this mental battleground that seems to drive him from non-committal almost bystander to something like his old self. Given Dicks' past as script editor during the Third Doctor's run, the methods he uses in several close combat run-ins with a Player assassin may not prove much of a surprise! "I caught a salmon there once. Would have hung over the sides of this table. Shared it with the Venerable Bede. He adored fish." But the real joy lies in the Doctor's rediscovery of his current self, Endgame arriving towards the end of the Earth Arc sandwiched between The Turing Test- the events of which are referenced several times- & Father Time. At the outset of Endgame he observes his own personal past, as his previous incarnation & Ace leave the Festival of Britain. This of course happened in Exodus ,''Uncle Terry''s contribution to the Timewyrm trilogy seeing an alternative timeline of Nazi rule over England coming to fruition thanks to the entity's bond with Hitler.